← Happy 100th Birthday WP668 Caboose! 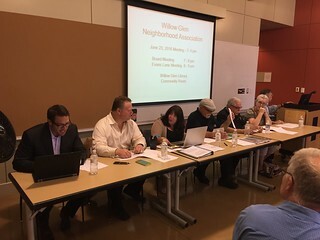 On 23 June 2016, about fifty people attended the Willow Glen Neighborhood Association (WGNA) Board meeting at the Willow Glen Public Library Community Room. The WGNA was started in 1973 and over the years has done some good work speaking on behalf of our community within the City of San Jose. One of the most controversial topics discussed by the WGNA has been the Road Diet discussion which has sharply divided our neighborhood for over a year. The San Jose City Council will discuss making the Road Diet (“Lincoln Avenue Pilot Project”) permanent at their 28 June 2016 meeting. Please join me there tomorrow if you want your voice to be heard on this contentious local issue. The Lincoln Avenue Pilot Project report by the San Jose Department of Transportation (SJ-DOT) has been finalized and will be reviewed by the City Council at its 28 June 2016 meeting. The 23 June 2016 meeting started with much confusion. It seems that there was a WGNA meeting on 25 May 2016 that about six neighbors attended at which the 2016-2017 WGNA Board was elected. WGNA has shrunk so much that six seems to have been a valid quorum. 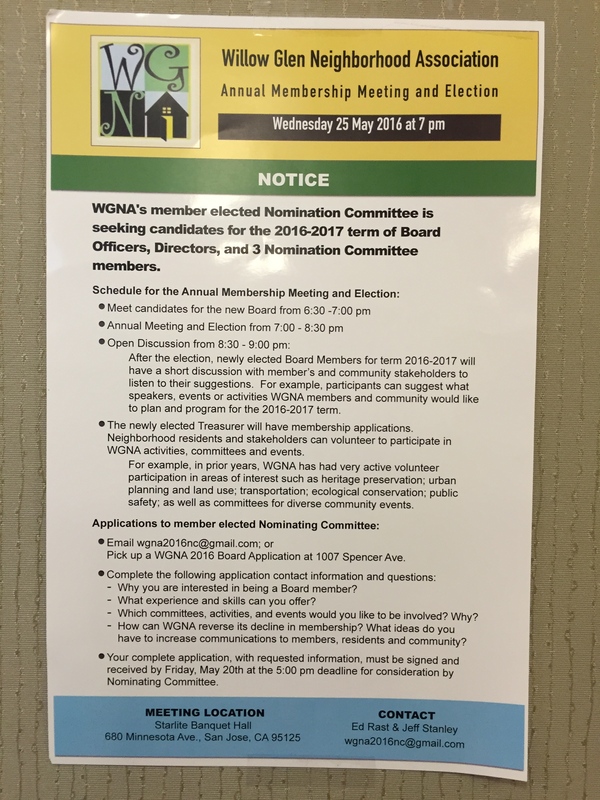 Minutes of the 25 May 2016 election and Board Meeting were distributed on 23 June 2016, along with copies of the poster the WGNA Nominating Committee used to announce that meeting. 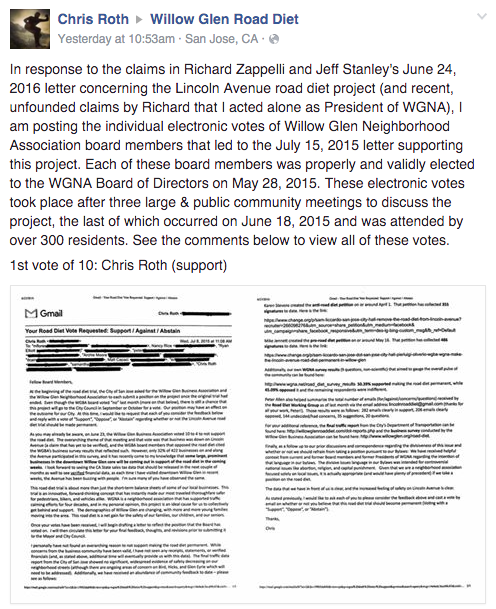 From what was reported, it seems that some members of the 2015-2016 WGNA Board would not cooperate in announcing the 25 May 2016 Board election through WGNA email lists and website, so the 2016-2017 Nominating Committee did the best it could through other means of communication. There are still debates going on Facebook over who said and did what when. 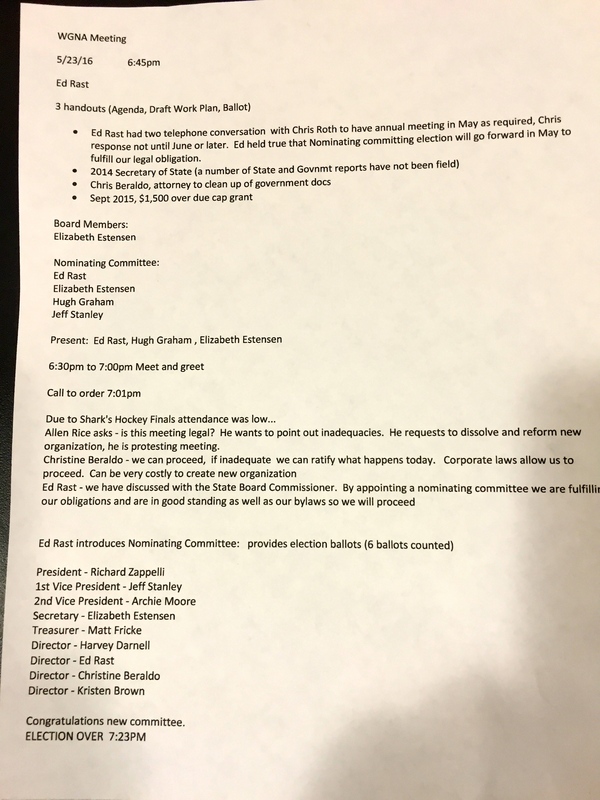 The 2016-2017 Board told us on 23 June 2016 about about closed-door Board meetings held during 2015-2016 about which there were no minutes posted (closed-door meetings are against WGNA By-laws and Policies). As of last week, the 2016-2017 WGNA Board was still working to get access to the WGNA bank account and website. 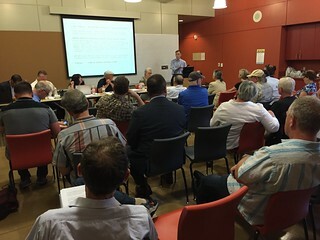 The WGNA 2016-2017 Board voted on 23 June 2016 to write a letter immediately to the San Jose Mayor and City Council asking for a postponement of any decision about the Road Diet. The 2015-2016 WGNA Board was one of the strongest supporters of the Road Diet and on 13 July 2015 sent a letter to SJ-DOT endorsing it. This 13 July 2015 letter is Attachment J of the 6 June 2016 Lincoln Avenue Pilot Project report. The WGNA 2016-2017 Board will ask the city for a delay so that the circumstances and position of that letter can be investigated. John Plocher and I have recommended that since parking is the biggest concern to local businesses (and the problem least addressed), if there were at least two multi-storey parking garages added to Lincoln Avenue, it would change the dynamics of traffic significantly for the better and would eliminate many of the problems of the Road Diet. More information about this recommendation is in my 22 June 2016 post. Thanks for this update Katy! How do we re-join WGNA? I clicked your link to the WGNA page but was unable to join (maybe that’s all on hold right now? )… we were members probably 7 – 10 years ago, would like to get involved again…sounds like a much needed fresh start! Everybody loves free parking. And we all know what happens when something is given away for free. Always wondered why Japantown has parking meters but Willow Glen does not. 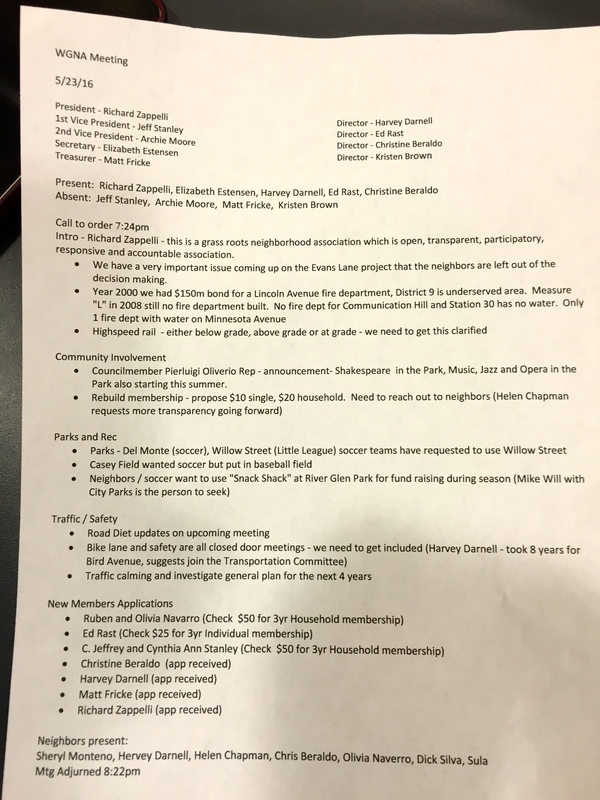 Of the $200,000 plus that the city receives in parking revenue the Japantown business district doesn’t get a dime for street improvement, event banners, trees, etc. To build a parking structure would cost about $50,000+ just to build the thing plus maintenance, security, lighting, interest, etc. For an excellent, in-depth discussion on the topic, may I suggest “The High Cost of Free Parking” by Donald Shoup..